1. Hammer mill can crush raw materials, such as soybean, maize, grain, wheat straw, cotton stalk, coconut shell, peanut shell, or small wood branch into powder. 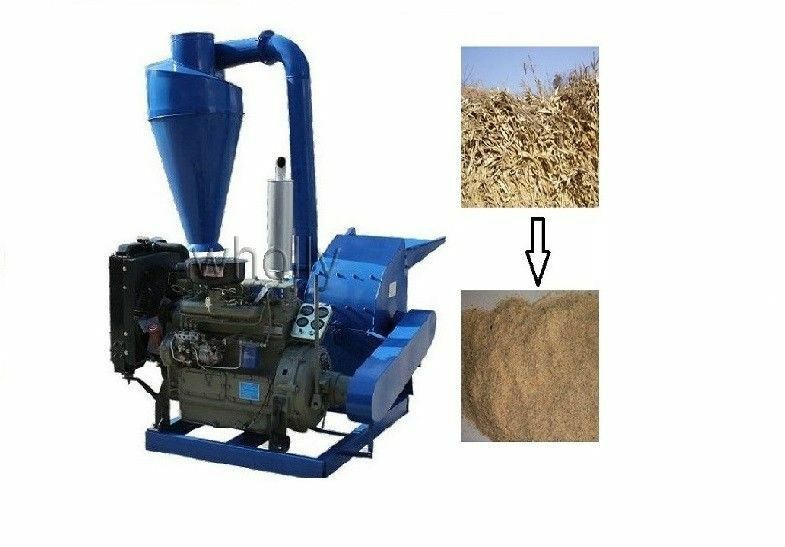 2.When this series hammer mill/animal feed crusher work, the raw materials will be fed to crushing room through the feeder, under the impact/crash of high speed rotating hammers, the raw materials will be crushed rapidly, then go through the screen and be sucked to the outlet. 3. Output powders’ length is depends on the sieve you use. We have 1.5mm, 2.8mm, 4mm or 6mm for your choice. 4. One set hammer sheet contains 16 pcs sheets. 5. CF500A is driven by 55hp diesel engine. 6. CF500B is driven by 22kw electric motor. Used for crushing fresh/dry sweet potato, straw, husk, wheat, corn, beans and etc, also suitable for crush other materials.